Apache Wicket is a Java component-based web framework, with a fast-growing community surrounding it. 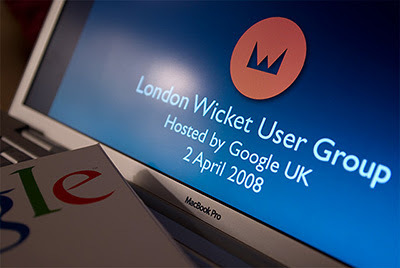 Google recently hosted the Apache Wicket London Users Group for the second time at our offices in the heart of the capital. We had over twenty developers attend, and we spent the evening hacking, enjoying presentations, eating pizza, hanging out and chatting. Check out the photos. We covered a range of topics, including integrating with The Dojo Toolkit and creating a reusable AJAX image cropping widget. Conversations continued afterwards at a local watering hole, and we had some really positive comments from people about how much they got out of the evening. Thanks to everyone in the Apache Wicket community who came along and made it such a great evening!